I never thought about posting this until I was asked the the other day after making the comment about the Flesh Tearers color scheme I was working on. My choices are "limited" to Space Marine color schemes since I don't really know the other armies that well to be honest. Most of my work is power armoured based and that's why I've been exposed to as many Chapters as I have. Since I don't have painted model in each of these color schemes, I've shamelessly raided the Games Workshop site to provide the artwork here. All of these images are theirs and I'm adding them here to show people who don't know the color schemes. So let's get started at the top. I think this is in part because of the color and in part because of all the background behind it. I don't know of a better story out there. I'm partial to Dark Angels so it's natural this is my number one choice. Like all good Dark Angel players, I'm working on my own version of the bone color scheme. It's been quite the ride too, lots of variations, and trials to get something I really like. No, not Iron Hands or Imperial Fists, but Iron Fists. You don't see these guys at all. I've never seen them painted in real life yet. There's just something about the steel grey armour and gold arms that just looks so cool to me. I've seen two variations on this theme. One has the armour more of a grey color with gold arms and the other has it more of a steel color (metallic) with gold arms. 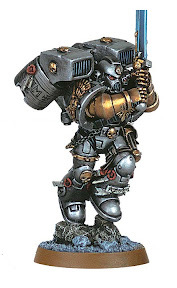 Between the two, I prefer the grey with the gold as I think the two colors contrast more and he doesn't become some kind of Grey Knight hybrid model. I'm not much for red on models. Blood Angles are cool, but they don't have that something "extra" to them to draw me in. I think it's the dark red against the black that does it here. It's not just your normal red color and it sets the black helmet and shoulderpads apart on the models. Or maybe it's just the fact that these guys are sporting a saw blade for their chapter symbol. In this day of political correctness, who could go wrong with that as an icon? I'm not a big fan of many quartered or halved or split color schemes, but this one strikes me as being cool. The combination of the red, white and yellow just pops. Toss in there that two of the three colors are hard to paint, and you don't see these guys often either. I think it's the yellow helmet that sets them apart. That off color makes them stand out against all the other combi-schemes out there. Squeezing into the top five is one Chaos warband scheme. Even though it's a fairly simple color scheme of all black, it's the broken lava on his shoulderpads and legs that I really like the look of. Getting the effect right would be key to getting the model to stand out. It's not much, but it's a difficult effect to do well I'm sure. And there you have it, my top five favorite color schemes. Each one draws me in for some reason or another and it's enough that I'd be willing to try my hand a painting an entire army up in the color scheme. Awesome concept for a post. I might just borrow the idea but from a Chaos Perspective instead. Damn, Iron Fists ARE cool. Also the helmet on that Hakanor dude is awesome..
That Iron Fists guy is striking. I wonder what that scheme would look like with just a bit more gold? Great post, Ron, and thanks for sharing. I really like your choices. 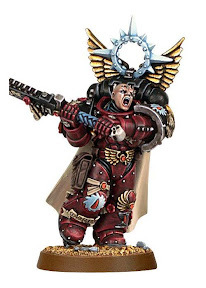 I can remember when I first got into 40K as a kid how I was really drawn to the Dark Angles terminator color scheme. Not only does the bone color look great covering the termie armor, but the red and green accents just make the whole thing pop. 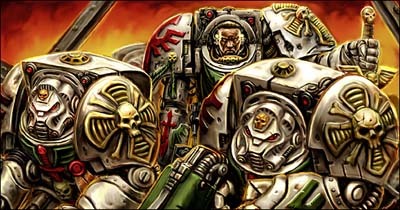 The Deathwing Terminators drew me into 40k when I first picked up some space marines looooong ago. I still think they look great. Personally I'll stick to my burgundy and parchment =P. Deathwing are my number one choice as well, for pretty much all the same reasons. Must confess I'd not heard of the Iron Fists until today, I do like that paint scheme. Wow, I thought this one was more filler than substance when it comes to posting. I'm glad so many people enjoyed this one. And I never knew Deathwing drew so many other folks in either. Stephen: Fire Hawks are up there, but I kept the list to the top five. They too have a great story behind them as well. There are so very many cool schemes. Pre heresy death guard looks fantastic (so does biel-tan). I believe the Night Lords have some pretty cool lightning going on (hope I got that one right). 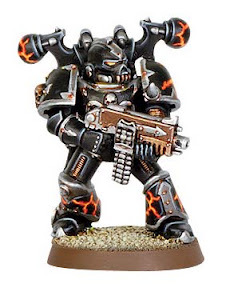 Legion of the damned sports some awesome black and flames and Ravenguard has this crisp B/W thing going. I love the Iron Fists color scheme, the metallic one at least (probably because I <3 Grey Knights). I've always loved the Reavers color scheme, it just looks so tough to pull off. That and Company of Misery (seen here: http://wh40k.lexicanum.com/wiki/Company_of_Misery) have always appealed to me. Is it just coincidence that these are all Space Marines or is it just due to the fact Space Marines are often much more open to customizable paint schemes, with a lot more surface available for detailed paintings? Michael: They are Space Marines because that's what I've had the most exposure to over my hobby experience. I really like the Company of Misery, very cool scheme they have, I've never seen them before. Space Marines are very prominent, with good reason. 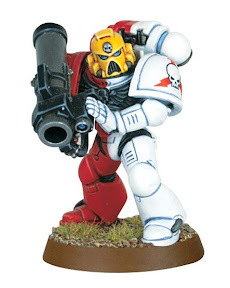 I, with shame, have never painted a non-Space Marine unit myself. I think if I were crazy enough, I would combine the Hakanor's Reavers and Company of Misery paint schemes into some lava-flame crazed chapter led by a fiery Daemon Prince. I think GW ruined the Blood Angels by removing a lot of the black. I just like the colors of them back from 2nd Ed. than now where they are just all red. Troels: It is interesting to look back over time and see how a Chapter has changed/evolved. Forge World does this sometimes too. Especially with the new Badab War stuff. Lots of Chapters seem to be getting face lifts. Isiah: Is there any other choice?